One of the most consistent and wide-ranging criticisms levelled at the O’Neill government is its poor economic management. As the country’s economic vital signs get weaker, the O’Neill government appears to be getting more desperate. A recent report that the national government is seeking once again to convince global money markets to take up a $500 million bond offering has been a hot topic for debate and scorn. Less known is the O’Neill governments decision to take ‘a bold but calculated risk’ to create an autonomous, self-governing haven for crypto-currencies in one of the nation’s more remote districts. Crypto-currencies are in effect an unregulated form of digital currency that uses encryption technology to store and trade its value. There are currently close to 2,000 different crypto coins, all of which provide a desirable amount of anonymity for criminals wishing to hide their true identities, such as terrorists, extortionists, identity thieves, drug and weapons dealers, and human traffickers. Crypto transactions do not require people to use their real names and do not move through financial intermediaries like banks or PayPal. Instead, users buying and selling coins are typically represented by unidentifiable addresses. Services that wash illicitly acquired crypto coins are widely available, the CipherTrace report said. Some are even advertised through Google AdWords. PNG’s haven for cryptocurrencies is to be created through a Special Economic Zone (SEZ). The SEZ will be governed, managed and operated by Ledger Atlas Inc, a Silicon Valley start-up company. The authority to issue passports, prosecute offenders and levy taxes, fees and fines are just some of the sovereign powers the PNG government will grant to Ledger Atlas Inc under proposed legislation currently before Parliament. The proposed SEZ is to have extraterritoriality status, it will be administered by its own autonomous Authority, independent from PNG’s existing government framework. 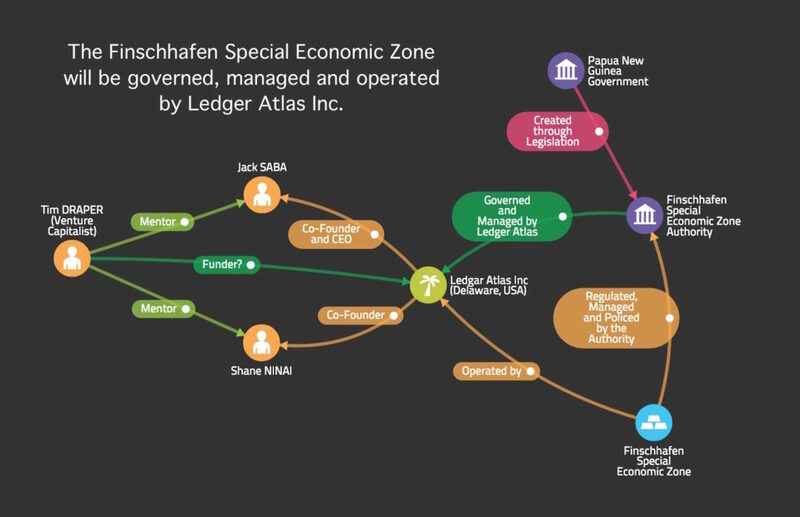 Diagram: Ledger Atlas Inc, an American company, based outside San Francisco in California, will have complete control over the new SEZ Authority. Papua New Guinea’s laws will not apply to any land designated as part of the SEZ and its courts will not have any jurisdiction. Any disputes between the SEZ Authority and the PNG government will be settled by international arbitration. Ledger Atlas will not only be the de-facto government within the SEZ, setting the rules and policing them, it will also have ‘exclusive rights’ to ‘develop and operate’ the SEZ [Section 38]. This effectively means it will be setting the rules for, and policing, its own operations with no external oversight. The preamble to the proposed legislation states explicitly the SEZ will restrict citizens constitutional rights to freedom from arbitrary search and entry; freedom or conscience, thought and religion; freedom of expression and publication; freedom of assembly and association; freedom of choice of employment; reasonable privacy; vote and stand for public office; reasonable access to official documentation; freedom of movement; and protection from unjust depravation of property. The draft bill includes a list of offences that can be committed on SEZ territory and, perhaps appropriately, sets the maximum fines in US dollars rather than PNG kina. Simple offences such as cutting a fence or pulling up a boundary marker attract maximum penalties of five-years imprisonment or a US$100,000 fine. [Section 78] The authority is empowered to conduct its own prosecutions. Finschhafen locals are understandably alarmed. Their District covers hundreds of square kilometres and there is no indication of how much land will be given up to the SEZ or how it will be designated. The draft bill says any land must be acquired in accordance with the Land Act, but that law prohibits foreign nationals from buying customary land. Local people have started their own petition against the proposed legislation, citing numerous concerns including the lack of consultation, constitutional and land issues. But who is Ledger Atlas Inc. and why is the national government seemingly willing to auction off its sovereignty to this company? Although based in California, Ledger Atlas Inc. is registered in the American State of Delaware – a region dubbed America’s corporate secrecy haven by Transparency International. It’s website is singularly uninformative about the company’s governance, experience and capabilities. 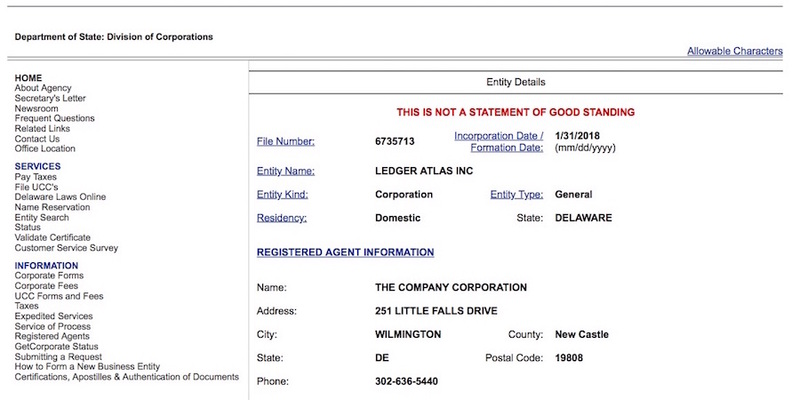 Ledger Atlas Inc was only registered in February 2018. Delaware is a popular location for company incorporations because it is a tax haven and has ‘flexible business laws’. The favourable tax regime includes no corporate income tax for companies that do not transact business there and no personal income tax for non-residents. Even the courts are described as ‘company orientated’ and use judges rather than juries. Shareholders, directors and officers of a company registered in Delaware don’t need to be residents. According to media reports, Ledger Atlas was co-founded by Jack Saba and Shane Ninai. Saba describes himself as a ‘Blockchain Public Speaker, Investor and Policy Advocate’. Not necessarily the sort of description you would expect for someone who could soon be issuing citizenship and passports to the new foreign residents of Finschhafen! Ninai seems equally ill-fitted to such an onerous responsibility. He is a PNG national and entrepreneur. One of his first business ventures, Shortcut Groceries, was launched in 2015. Shortcut Groceries does not appear to be trading any more but Ninai has also set up several other companies in PNG including Shane Ninai Venture Merchants Limited, Shortcut M-Commerce and Logistics Limited and Shortcut Refills Limited. None of these companies has ever filed an Annual Return with the Investment Promotion Authority. Further investigation has revealed that Shane Ninai shares a postal address with Ninai Lawyers, while his registered office is next door to the latter’s premise. Ninai Lawyers is a business name registered to its principal Bonny Ninai, a controversial lawyer linked to Beldan Namah. It is not clear what, if any, connection Ninai lawyers has to the current case. 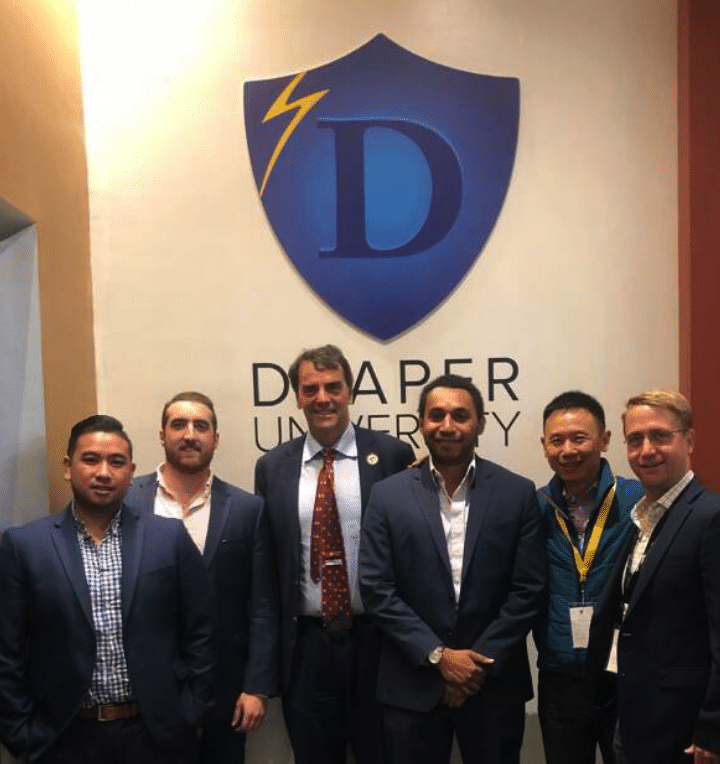 Ledger Atlas though does claim the backing of one wealthy investor, venture capitalist Tim Draper. He has tweeted his support for Ledger Atlas and the O’Neill / Abel government and what he describes as ‘our first crypto zone’. Ledger Atlas was only registered in February 2018, but within two months the company was holding a press conference with a rather cautious looking Deputy Prime Minister and Minister for the Treasury, Charles Abel. Abel’s caution may be well placed given Ledger Atlas’ short existence, the recent negative publicity about cryptocurrencies and the dramatic slide in the value of Bitcoin. According to Abel the agreement he signed between Ledger Atlas and the PNG government was ‘only’ a memorandum of understanding and a full feasibility study would be undertaken before any decisions were made on further collaboration. Roll on four months and no feasibility report has been published but the draft Bill commits the PNG government to sign a Memorandum of Agreement based on the MOU signed with Ledger Atlas on 5th of April 2018. The bill gives that MOA the force of law and dominance over any other laws. It compels the national, provincial and local level governments and government departments to comply with the MOA. [Section 4 and Schedule 1]. The questions this investigation throws up seem almost limitless, but one wonders how the global investors Credit Suisse and Citigroup, the coordinator and joint-lead managers for PNG’s $500 million bond offer are trying to tempt, will react. The Financial Times reports that potential investors have been scared off before by PNG’s ‘violence, corruption and governance shortfalls’. The government’s approach to the Finschhafen SEZ and the sovereignty it is prepared to cede to Ledger Atlas Inc is hardly likely to reassure them things are getting better!